The San Francisco 49ers and SAP have teamed up once again to transform the way that professional sports organisations use data and analytics to enhance the in-venue sports and entertainment experience. The latest co-innovation project by the long-time partners is a first-of-its-kind venue management solution called Executive Huddle. Powered by SAP Leonardo and Analytics, Executive Huddle provides the business strategy and analytics team with real-time data and visualisations spanning multiple data sources, to track, sense and respond in the moment during games to optimise operations and enhance the fan experience. 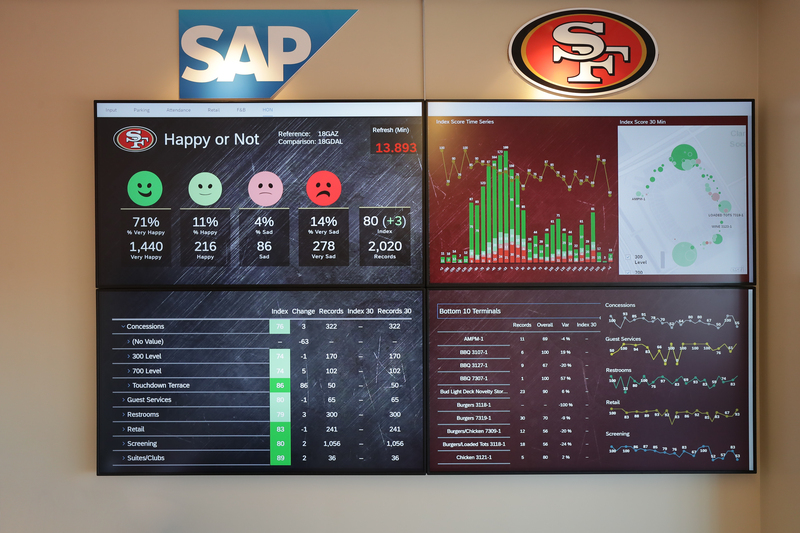 Heading into its fifth season at Levi’s Stadium, the team was looking for an innovative solution that would aggregate and report real-time information enabling the organisation’s award-winning stadium operations team to make more informed decisions, proactively address potential issues and seize opportunities during games and events, not days later. Housed in a suite overlooking the field at Levi’s Stadium, and accessible via mobile devices, Executive Huddle pulls real-time data from nine different sources, including attendance, parking, food and beverage, retail, ticketing, social media and more. Displayed on interactive screens, team officials can see and monitor data visualisations and identify an issue or opportunity, act on it, and see immediate results across venue operations and the fan experience. Using Executive Huddle, team management can drill down into specific areas of the stadium, as well as benchmark real-time data against past games and seasons for a more contextual view of their operations. Following testing during the pre-season, Executive Huddle has been fully operational for three home games since the start of the regular season. Already, real-time data and insights have proved to be extremely valuable, as the team has shifted its operational approach from reactive to proactive. For example, examining ticket data has allowed the 49ers to see how fans are entering the stadium, and by collaborating with their staff on-the-ground to direct fans to the appropriate gates, wait times to enter Levi’s Stadium have decreased. Executive Huddle utilises SAP Leonardo solutions, including SAP Analytics Cloud running on the SAP Cloud Platform, as well as the SAP HANA database and provides flexibility and a foundation for continuous innovation for seasons to come. Support from partners at Happy or Not and NIMBL were also crucial in the development and implementation of Executive Huddle.